There are some things in life you can't go wrong with. The little black dress, diamond earrings, fine bone china. Chocolate tart. Bubble baths. A good book. Fresh flowers. And prawns with garlic, chilli and white wine. I try to always have a bag of prawns in the freezer. Fresh from the market, preferably bought at 4am, is better, I know, but let's pretend I have a Little Girl, and I can't remember the last time I wasn't at least half-tired. Therefore, fresh from the freezer is the best you'll get at my house. I always look at prawn recipes, and apart from the occasional green curry, I mostly end up cooking it with garlic, chilli and wine. Why mess with a winner? That was the plan last night, until I had a quick look at my go-to website for recipes, http://www.taste.com.au/. Lovely site, this one. Whatever I look for, I often end up using a recipe from here. So I typed in "prawn", and this great recipe came up: Prawns cooked in tomato sauce, and then baked with pasta in little parcels. As I mentioned before, I don't really "do" tomatoes, especially not with fish, but I really liked the idea, and thought I'll use my normal recipe and finish it off in the oven. I do realise that this is nothing new. In fact, I'm sure most of you guys think that cooking in parcels is SO 2007. Please bear with me. I'm sometimes a bit slow. You know what? It was fabulous, if I may say so myself. I thought it would be good (the basic recipe is a winner, after all), but this was beyond a winner. This was like Titanic winning 11 Oscars. 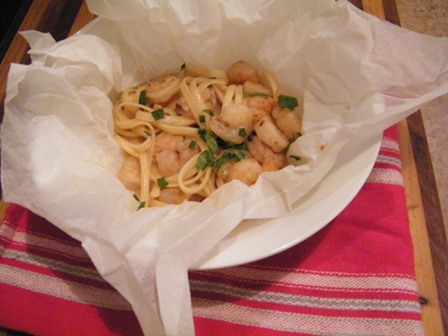 You'd think it will be your basic pasta dish, only served in a paper parcel. Not so. The final blast in the oven combines all the flavours beautifully, and the pasta itself becomes infused with the flavours of the garlic, chilli and wine. I used only enough chilli to give the pasta a nice warmth, as I'm a bit of a wimp when it comes to heat. Feel free to up the amount based on the toughness of your tastebuds. If you, like me, prefer to see if a new trend (like cooking in parcels) stands the test of time before trying it out, and haven't tried this before, let me assure you that this one is a keeper. Think of it as the pasta version of an interesting twist to the little black dress. Preheat your oven to 200°C. Cook the pasta in a large pot of water for 7 minutes (you want it slightly undercooked). Drain and keep seperate. Heat the olive oil and butter in a frypan until bubbly. Add the garlic and chilli, and cook for 2 minutes. Add the prawns, and cook until they just turn pink. Add the white wine and pasta, cook until heated through. To make the parcels, cut 2 pieces each of baking paper and aluminium foil, about 35cm square. Place a piece of baking paper on a piece of aluminium. It helps to put this into a bowl, to prevent the juices going everywhere. Place half of the pasta in the parcel, and fold over the edges to seal. Repeat with the other parcel. Place both parcels on a baking sheet, and bake in the oven for 6 minutes, or until the pasta is cooked through. Serve in the parcels, sprinkled with a little chopped parsley. that looks GORGEOUS! I love the idea of parcels. Thanks - this is definitely going to get made!! Well, I'm even slower than you - haven't tried cooking in parcels yet. Always look so elegant upon presentation though, doesn't it? PS - Love love love taste.com. Also one of my go-to sites.